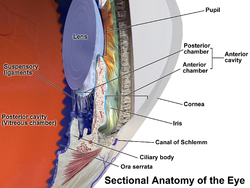 Anatomy of the anterior part of the human eye. "Suspensory ligaments" are labeled at left. The zonule of Zinn (/ˈtsɪn/) (Zinn's membrane, ciliary zonule) (after Johann Gottfried Zinn) is a ring of fibrous strands forming a zonule (little band) that connects the ciliary body with the crystalline lens of the eye. These fibers are sometimes collectively referred to as the suspensory ligaments of the lens, as they act like suspensory ligaments. The ciliary epithelial cells of the eye probably synthesize portions of the zonules. 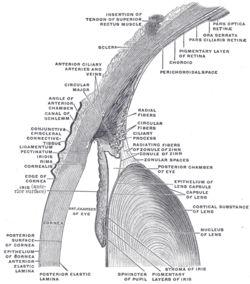 The zonule of Zinn is split into two layers: a thin layer, which lines the hyaloid fossa, and a thicker layer, which is a collection of zonular fibers. 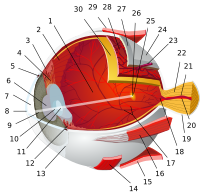 Together, the fibers are known as the suspensory ligament of the lens. The zonules are about 1–2 μm in diameter. The zonules attach to the lens capsule 2mm anterior and 1 mm posterior to the equator, and arise from the pars plana region of the ciliary epithelium and pass forward closely related to the lateral surfaces of the ciliary process of the pars plicata. When colour granules are displaced from the Zonules of Zinn (by friction against the lens), the irises slowly fade. In some cases those colour granules clog the channels and lead to Glaucoma Pigmentosa. The zonules are primarily made of fibrillin, a connective tissue protein. Mutations in the fibrillin gene lead to the condition Marfan syndrome, and consequences include an increased risk of lens dislocation. The zonules of Zinn are difficult to visualize using a slit lamp, but may be seen with exceptional dilation of the pupil, or if a coloboma of the iris or a subluxation of the lens is present. The number of zonules present in a person appears to decrease with age. The zonules insert around the outer margin of the lens (equator), both anteriorly and posteriorly. ^ a b c Kaufman, Paul L.; Alm, Albert (2010). Adler's physiology of the eye (11th ed.). St. Louis, Mo: Mosby. pp. 145–146. ISBN 978-0-323-05714-1. ^ a b Bornfeld, Norbert; Spitznas, Manfred; Breipohl, Winrich; Bijvank, Gerhard J. (1974). "Scanning electron microscopy of the zonule of Zinn". Albrecht von Graefes Archiv für Klinische und Experimentelle Ophthalmologie. 192 (2): 117–29. doi:10.1007/BF00410698. PMID 4548321. ^ McCulloch, C (1954). "The zonule of Zinn: Its origin, course, and insertion, and its relation to neighboring structures". Transactions of the American Ophthalmological Society. 52: 525–85. PMC 1312608. PMID 13274438. ^ Farnsworth, P. N.; Mauriello, J. A.; Burke-Gadomski, P; Kulyk, T; Cinotti, A. A. (1976). "Surface ultrastructure of the human lens capsule and zonular attachments". Investigative Ophthalmology. 15 (1): 36–40. PMID 1245377. This page was last edited on 27 November 2018, at 18:55 (UTC).